I decided to write this post today, 5th September, in honour of two different celebrations: firstly it is Teacher's Day and secondly it is Ganesh Chaturthi. For those readers not living in India, I need to explain that Ganesh is the Hindu god of new beginnings. On this day, idols of Ganesh are brought into people's homes. The festival lasts about 10 days, at the end of which the Ganesh statues are immersed in water (in Mumbai this means they are immersed in the sea). 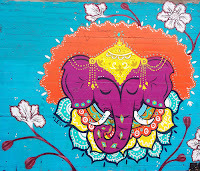 As I'm writing this I can hear drums in the street - someone is bringing a Ganesh home. I write this because September is typically the time of year when international teachers starting thinking about moving on - about making new beginnings. It may seem early in the school year - after all we have only just started back - but the reality is that many teachers and many schools want to make a decision by the end of this month so that they can start hunting for jobs and for great teachers to replace the ones who are leaving. Our Leadership Team, for example, has a goal of filling a minimum of 75% of our recruitment needs before the December break. I think I've written before that becoming an international teacher was one of the best decisions of my life. When asked about this some years ago I said my only regret was that I didn't do it sooner - that I worked in the UK for 6 years before leaving. In fact, this wasn't strictly true - I had lived overseas before becoming a teacher and maybe it was this experience that made it an easier decision for me to move overseas again. All entries against great men in encyclopaedia announce two essential facts: the period in which they lived, and the place in which they lived. No man ever has control over the age into which he is born. Is that not restriction enough? Then go to America! Of course, having moved overseas once, it was easy to do it again. I've now lived in 7 different countries, and every one of them has been a joy. It's great to really immerse yourself in a new life, and learn to appreciate new things. There have been a lot of articles written recently about how experience is more valuable than things, and for me this is certainly true. I may never have the big houses and nice cars that my friends have, and the closer I get to retirement the more I start to worry that I might also not have enough money to get me through - but the experiences I have are golden - worth more than anything. Of course it hasn't always been easy, but the challenges I've faced have turned me into a better person. I've learned a lot about myself and about life and I've become good at solving problems. So this brings me to the point of today's blog post. Two years ago I was involved in discussions at ASB about the possibility of starting the Global Recruitment Collaborative, a virtual job fair for teachers who want to move between international schools. We knew that good international teachers are very choosy about where they want to go and who they want to work with. We also know that a personal recommendation from a leading educator in a good school is worth much more than any number of open testimonials, references and glossy websites. We started with a small group of hand picked schools and their teachers, and opened up a virtual job fair very early in the recruitment season. Our goal was that good teachers and good schools wouldn't need to waste time and money on traveling to job fairs, but that they could go through the whole process online and cost free. In the first year of the GRC around 400 teachers moved between the GRC schools. Last year we expanded this a bit and more schools joined. Now that we are in Year 3 of the GRC we've decided to go a little further and to prototype a face-to-face job fair, while still keeping to the idea of "recruitment simplified". It's still going to be cost free. The fair will be held in Dubai over the weekend of 12-14th November. Interested? Visit the website and sign up. Currently the fair is only open to teachers who are teaching in schools that are part of the GRC, or alumni of those schools. If your school is not part of the GRC, now is the time to approach your Head of School and ask to get involved. Happy Ganesh Chaturthi! May this year be full of new beginnings for you!